If you drink alcohol, you are bound to have an occasion where you got caught up in the moment and consume more than you should. Maybe the drinks were especially tasty, maybe the mood was just right, or you forgot to set limits on yourself before the night started. Whatever the reason, it happened and now you need to “right the ship” and get back on track. 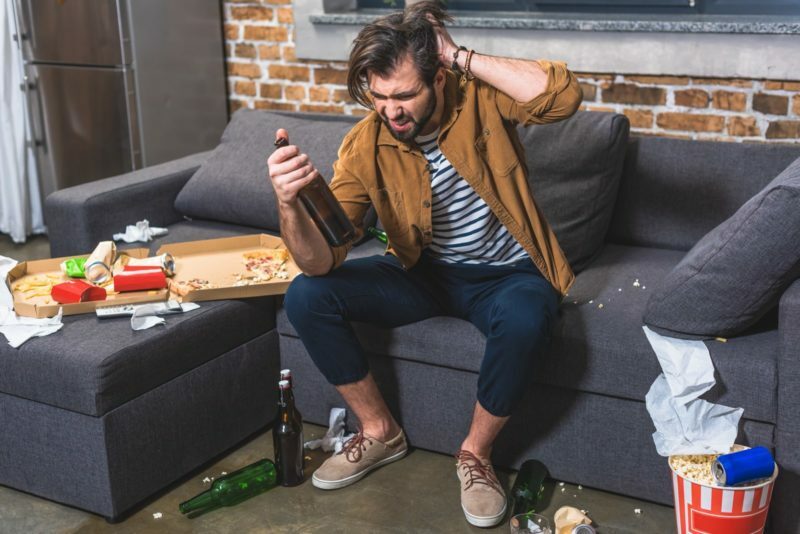 When it comes to erasing the pain caused by alcohol intoxication, there is no perfect solution, nothing you can take to completely obliterate the symptoms, but take heart, there are some simple tricks that make the process a little less painful and get you on the road to recovery. C’mon man, the whole point of the article is to help us deal with drinking too much! I know, but seriously, learn your limits and stick to them. 🙂 If you want to enjoy the experience of drinking in moderation, then don’t become an alcoholic, because if you do, you could lose your family, your life and your beloved alcohol the rest of your life. I say this tongue and cheek but really, I wouldn’t have to write this article if people didn’t abuse alcohol. I include myself in this statement. I’m just as capable of mayhem as anyone else but I’m still engaged in the dance and trying to make the world a better place. You should too. Truth is, we all need to learn how to do everything in moderation and sometimes stepping across the line to see where it is, can help us know when enough is enough. Drink early and then quit. This is a sound piece of advice, if your going to drink alcohol. Pounding 2 glasses of drink at the end of the night is about the worst thing you can do if your care about your body. Once you’ve had your fill of alcohol, the fun is over. You’ve tipped the scale and no amount of alcohol is going to make you or anyone else around you feel better. So get your drinks in early in the evening and then start hydrating eating and moving around so the next morning is pleasant rather than painful. Hydration is underappreciated and potentially most impactful on your quality of sleep and the next morning’s outcome. Since alcohol is a diuretic and dehydrating you will often wake up with a dry mouth and a headache. It is then that you suddenly realize you forgot to hydrate before and after the festivities. Keep in mind that water when consumed in the right amount will do a number of wonderful things. It dilutes alcohol, reducing blood-alcohol concentration which can potentially keep you out of jail. It decreases blood and fluid viscosity which allows for optimal metabolic function in all organs, and it improves brain, cardiovascular and liver function. If you don’t care about the long term effects of poor hydration, then just think of the immediate benefit of less pain and better sleep. Restore electrolyte and mineral balance! Your current electrolyte and hydration status will have a lot to do with you you will handle a night of drinking. The type of alcohol you drink can also greatly affect on how your body responds. Too much beer can increase fluid volume in the blood and lead to sodium depletion, but your current state of hydration can cause your body to retain sodium and cause water retention and bloating. Confused yet? This is just a peek into the complexity of electrolyte and fluid balance. Potassium can be retained under certain circumstances but it can also be depleted along with magnesium and calcium after a hard night of drinking. Other nutrients that are depleted from drinking alcohol are zinc, selenium, and iron due to poor absorption in the GI tract. Take a B vitamin complex! If you drink alcohol, you should consider taking a b vitamin complex on a regular basis. B12, folate and B1 can be directly affected but all of the vitamin b levels in the body depend on vitamin B1 or thiamine. Zinc and the B vitamin Niacin are both used by the body to detoxify ethanol. If they are deficient, your body can’t get the job done. Take compounds that support relaxation. Alcohol binds to GABA receptors in the nervous system. GABA as a neurotransmitter facilitates relaxation, decreased stress and anxiety, and promotes balance for the excitatory nervous system. Restore your blood sugar response. This work is not done the day after a drinking incident. If you want to prepare your body for an occasional night of fun you might need to have some testing done to see if your body is handling blood sugar appropriately. Fasting blood sugars, HbA1c, free fatty acids, C peptide, and OGTT are all tests that will tell you how well you are managing your sugars and your risk for type 2 diabetes which is absolutely preventable and reversible in many people. Adequate nutrient intake provides nutrients lost during and after drinking. Eat a good meal around the time you are drinking to reduce the impact of the alcohol. A big nutritional breakfast full of protein and vegetables can also be a really good way to combat a hangover and put you back in a good space. This entry was posted in Alcohol, Blog, Diet/Nutrition, Exercise, Fitness, Hangover, Hangover Cure, Health, Liqueur and tagged Alcohol, Hand Over, Hangover, Hangover Cure, Liqueur, Morning Recovery.